How to bring your site up in Google search? 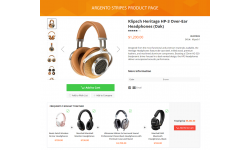 Looking for ways to improve the usability of e-commerce store? 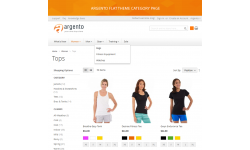 Argento is a brilliant template for Magento. 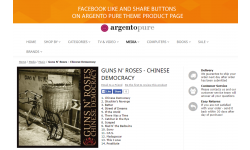 Argento is focused on the best and innovative e-commerce practices. It provides you with 7 unique themes with wonderful design and rich features. You can use 60+ outstanding options in order to provide your customers with perfect product presentation and amazing shopping experience in your store. Our Magento responsive template was designed for any kind of store either for fashion store, jewelry, watches or for toys, bags, computer, etc. Help search engines find your website. 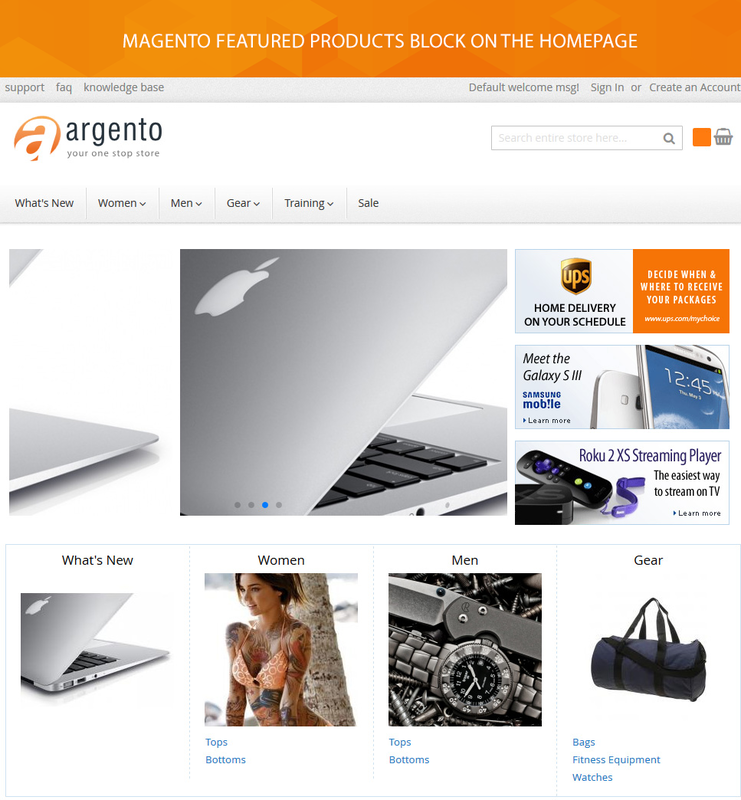 Argento works well on Magento EE 1.11.x-1.14.x, Magento CE 1.6.x-1.9.x, Magento CE 2.0.x-2.3.x. The template is available only for YEAR & QUARTERLY SUBSCRIPTION. 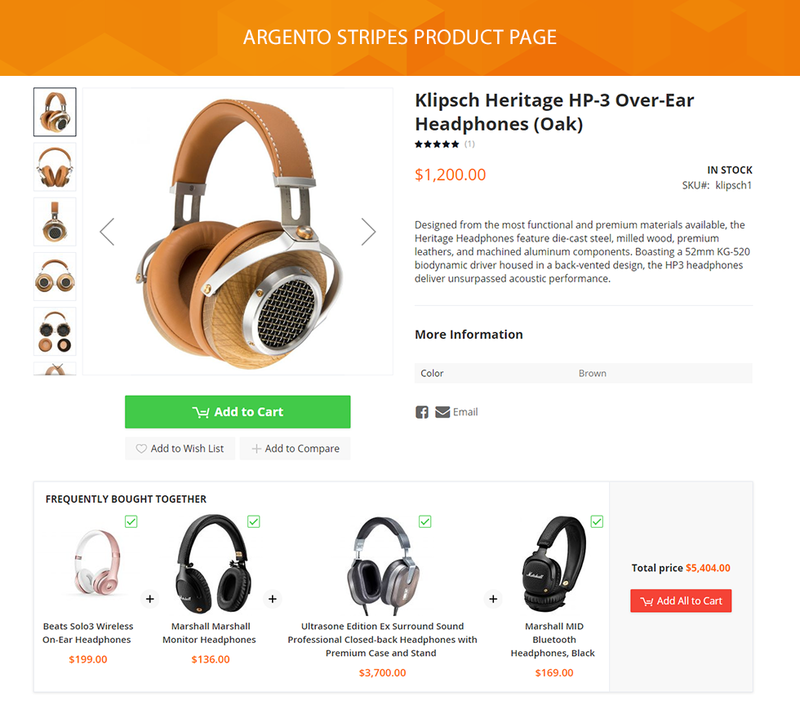 Argento template allows you to choose from 7 themes: Argento Luxury, Argento Stripes, Argento Pure and Pure 2, Argento Mall, Argento Argento, Argento Flat. Three types of the layout are supported: boxed, full-width and standard. All Argento designs will help you to achieve a strong visual impact in advertising your products and services. Argento is based on CSS sprite techniques that help to reduce the number of server requests and save bandwidth. In order to make download speed faster, Argento code is minified by the default Magento merger, Fooman Speedster or GT Page Speed. 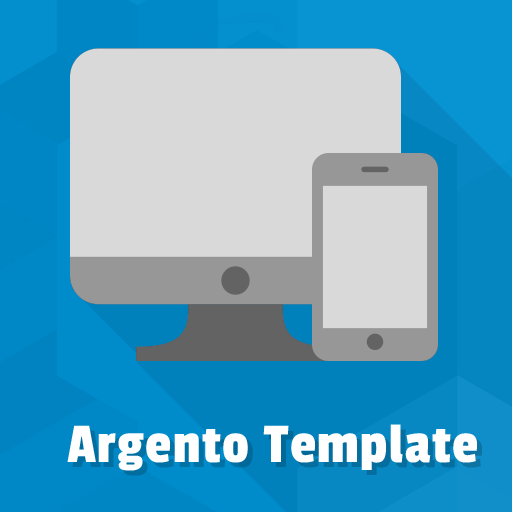 These speed optimization tools make Argento the fast loading responsive theme. Argento is very flexible and easy to style. It provides you with sub-theme support for creating your own custom look for the website. You can create the custom themes without modification of core theme files. Via the override feature, you are allowed to change CSS styles, the template and layout files. You can also change the color scheme, font, header, etc. in the template configurator. 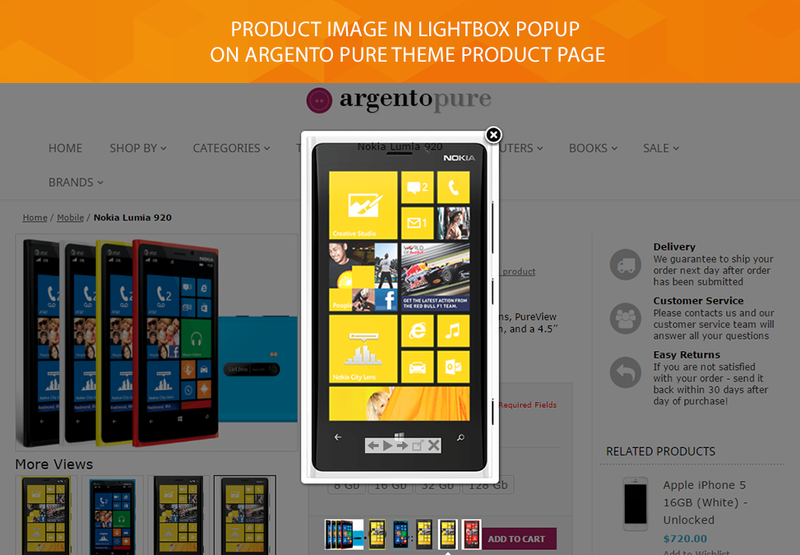 Argento theme is a trusted way to deliver content and services for mobile users. It works on iOS, Android, and BlackBerry and fits all screen resolutions. 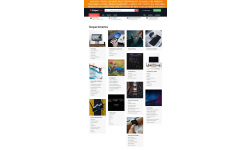 Our theme also includes AMP module that allows you to create custom content in AMP files such as separate homepage, products page, AMP blocks in a footer, etc. as well as significantly improve a web page load speed. That way you create the Magento website fully optimized for mobile devices. 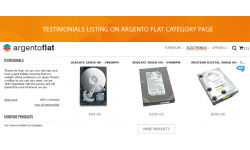 Argento was developed with best SEO practices. Having the improved HTML structure, the template helps to prevent the major SEO mistakes that can happen in the default Magento theme structure. 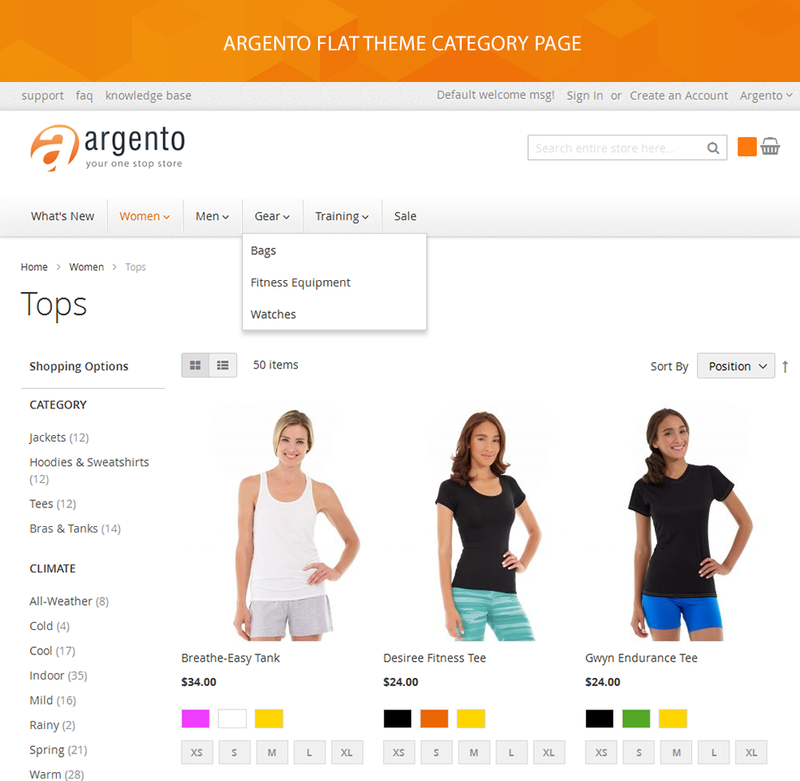 Argento theme comes with SEO Suite module that includes SEO Metadata templates, Rich Snippets, HTML and XML Sitemap. Our template will help you to have any impact on search rankings in Google, Yahoo, Bing, etc. 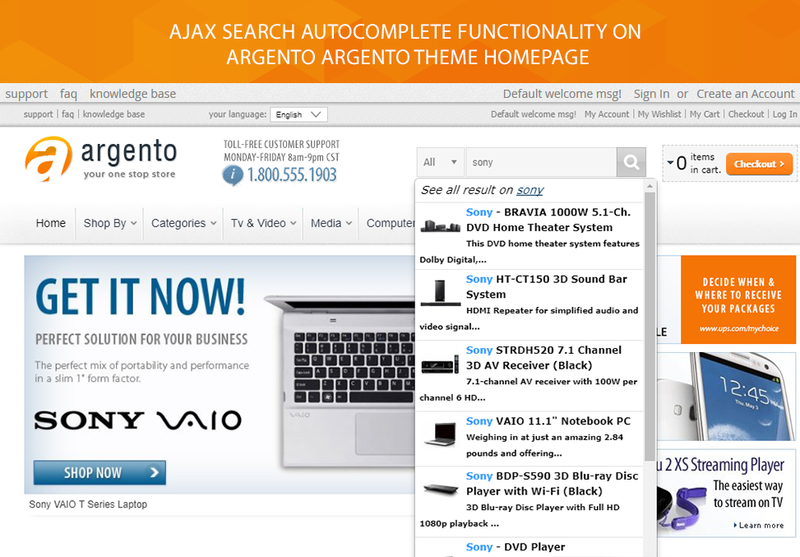 Argento is full ajax powered theme with the following functionality: quick page reload via ajax, catalog compare and wishlist ajax actions support, the auto-loading products on category page, ajax search autocomplete feature, ajax login popup, ajax shopping cart, the display of different dialog window types while adding the item to the cart, setup of Login form block and Cart block in the header store block. 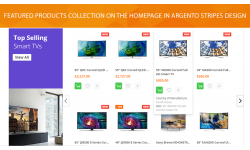 Argento widgets were created to provide a simple and easy-to-use way of adding the different content to your Magento site. 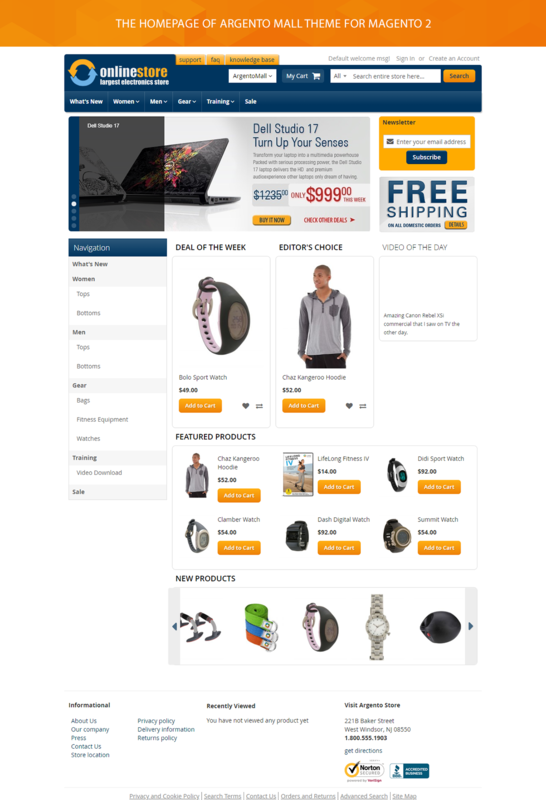 You can use widgets to place banners; add the blocks with featured products both on the homepage and product page; show testimonials list; show category/ subcategory listing block with assigned images; add a lightbox image gallery; display product attributes or brands in the main menu of your store, place a discussion block on CMS or category page. All widgets are widely configurable. 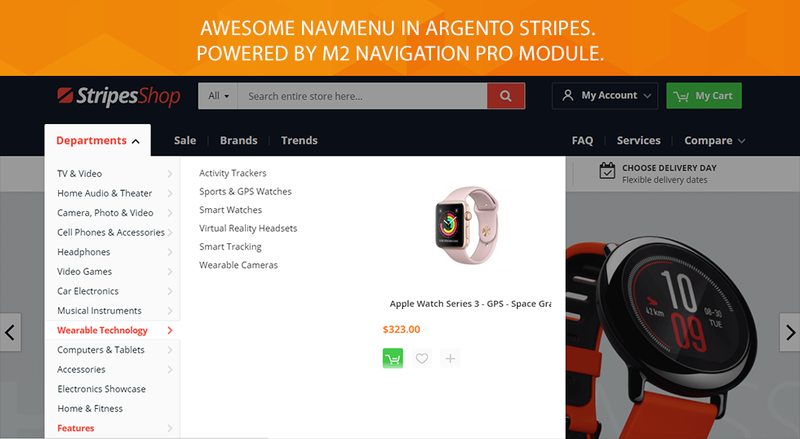 Coming with a Navigation Pro module, Argento enhances the navigation all around a store. 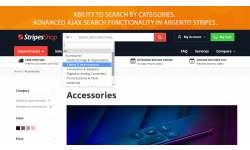 Thus you can create the drop-down, vertical, horizontal, folding and static menu as well as a menu like Amazon; suggest the search by brands and product attributes; create the unlimited number of navigation trees with custom columns inside. You can also place text/banner above or below the drop-down and show multiple subcategories per one drop-down with additional links. 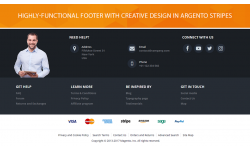 Argento theme allows you to add attractive banners anywhere on a webpage. Built-in Easy Banners module enables the display of banners and custom content like the information about scheduled events or holidays related content as well as the display of the payments and security icons. 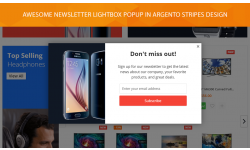 You can show a banner to the targeted customer groups and show an important content in Lightbox window. Argento also enables the creating an unlimited number of image sliders. Swiper, Prototype and Nivo sliders are supported. 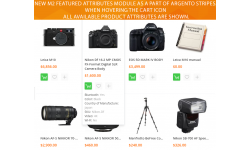 All Argento extensions are a must-have for your store if you really want to make the site to earn money. The following modules are included: Ajax Pro, Featured Attributes, Prolabels, Sold Together, Easy Product Tabs, Lightbox Pro, Ask it, Easy Catalog Images, Attributes and Brands Pages, Slick Carousel, Hover Gallery, Ajax Search, Easy Banners, Products Highlight, Image Slider, Easy Flags, Navigation Pro, Testimonials, Rich Snippets, SEO Suite, Magento AMP module, Review Reminder, Quantity Switcher. 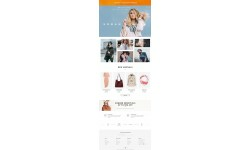 Hover effects on product image. Animated checkboxes and radio buttons, colourful buttons. Bootstrap grid system for the homepage and footer markup of Argento Pure/ Pure 2, Argento Flat and Argento Mall designs. New styles for product review form. Fancy ratings stars react to mouse hover. Supports English, French, Portuguese, Deutsch, Dutch languages. 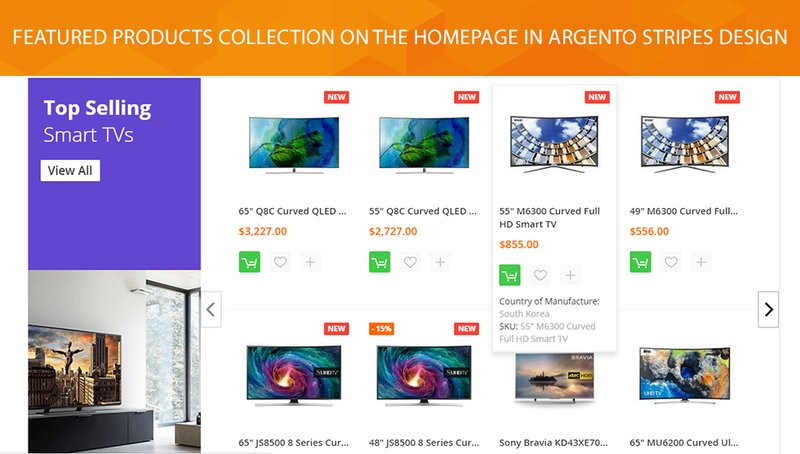 Argento products page allows you to show a valuable information without cluttering up the page. Lots of content such as product's questions block, product details or delivery conditions can be shown Easy Tabs in dynamic product tabs. 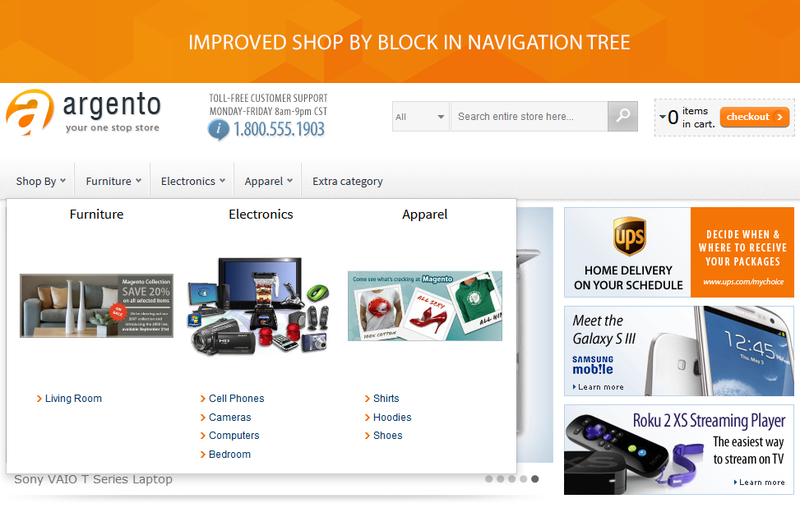 In order to double the order summary, you can suggest the products shown in cross-selling and related products blocks. You can highlight your brand by placing it alongside the product image or elsewhere. Facebook Like and Share buttons will help users to promote your store content. 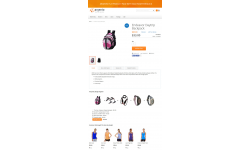 Via the Magento configurable swatches, your customers can play with different variants of the product and choose the best one. Small fixes in AjaxPro, AMP, Askit, EasyCatalogImages, NavigationPro, Highlight, RichSnippets, Testimonials, Suggestpage, and SeoCrossLinks modules. New option for Luxury design - enable/disable transparent header for homepage. Improved RTL styles for Luxury and Essence design. 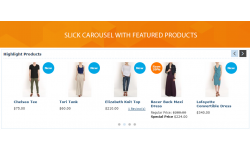 Improve handling of Magento messages after adding product to cart when Stock Inventory is enabled. Add plain text section to email templates to improve emails quality. Few minor improvements to frontend templates (simplify layout and render elements only when it is necessary). Fixed slow scrolling performance in Chrome when fixed banners are shown. Fix page jumping on scroll at mobile devices when nowrap feature for menu is enabled. Improved compatibility with AMP and others third-party extensions. Metadata templates - improve module stability during metadata generation. Rich Snippets - don’t add social links to organization snippet when there is no values in social links. HTML Sitemap - add canonical URL to sitemap page. Mobile-view styles improvements for the homepage in Argento Stripes theme. 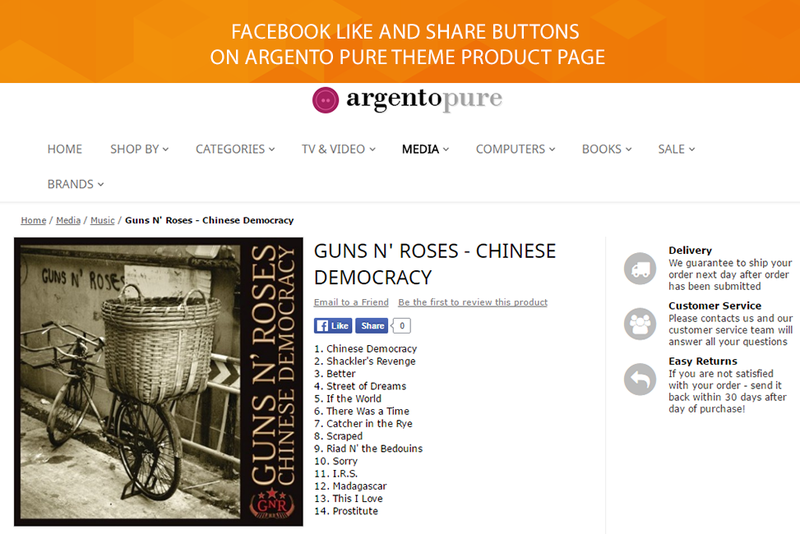 PageSpeed extension included into Argento package. Overall themes and extension stability improvements (AjaxPro, EasyTabs, Highlight). Fix empty customer new in email. Fix missing conditions on 2nd level in product tabs. Rich Snippets - fix validation error “id is null” at product page. HTML Sitemap - show only enabled CMS pages in sitemap. Greatly improved ProLabels module with new backend interface and a bunch of ready-to-use presets. 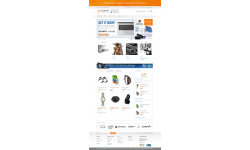 We added fantastic option to stick product image and/or product details at product page for every theme . Read more at Product Page configuration. 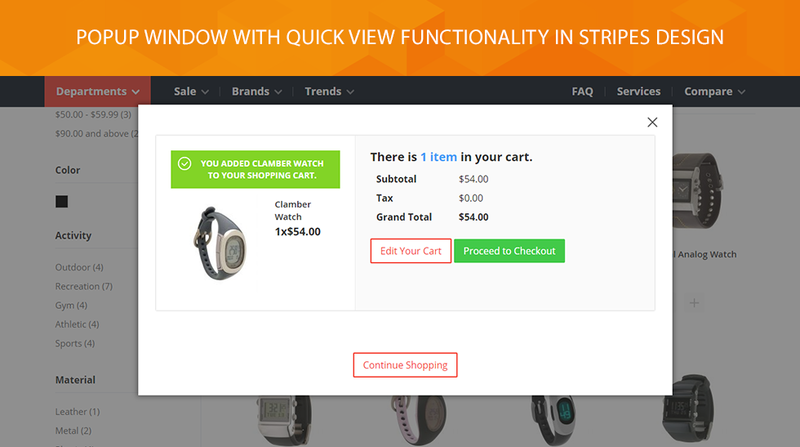 New feature to change produt image layout at product page. You can have default (old-school) layout or fancy mobile-friendly slider. Update deprecated mustache library to the version 0.2. Improved compatibility with old php versions. 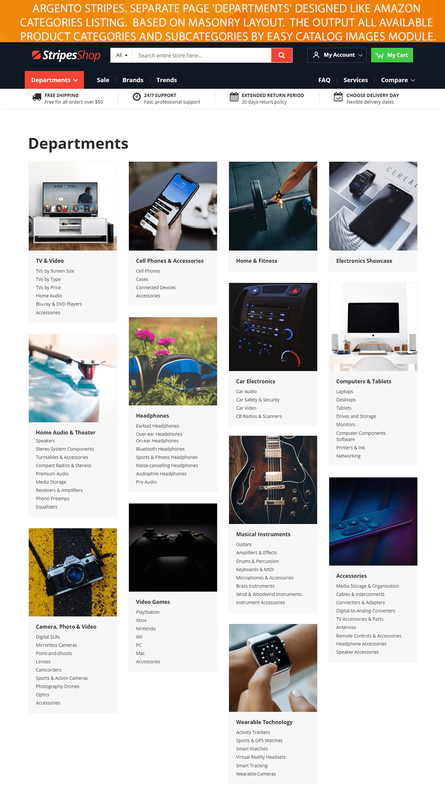 New option for product page image. You can select between default layout with thumbnails and slider with all images. We introduce new colorful theme - Argento Stripes. 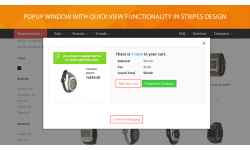 Check it out at Stripes Theme Demo. No more “jumping search” during page loading. 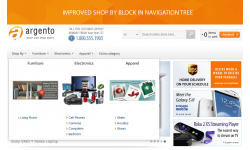 A lot of small fixes and improvements to provide your store the best user experience. Grid layout for suggestions popup. Remove product review summary and tabs from add product popup. Removed url validation as it does not allow to use .html suffix. Fixed ‘Undefined variable: options’ error for banners without placeholders. Added configurable ‘Departments’ page with masonry layout style. 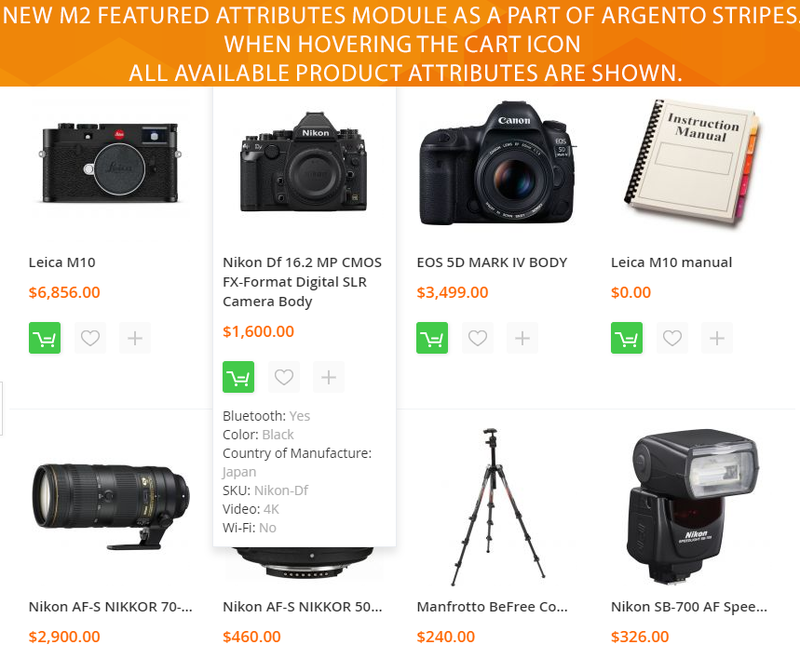 Added ability to show products widget as ajax carousel. Fixed bug when you can’t call for multiple widgets with different conditions on the same page. New simplified form to create menu with a few clicks. Optimize labels rendering on storefront. Do not add rating to snippet when product reviews do not have ratings. Improve compatibility with not English speaking stores. 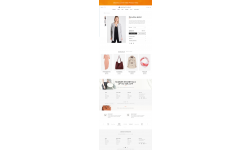 New Stripe layout for ‘Frequently Bought Together’ block. Now can can choose between ‘Amazon Inspired’ (default) and ‘Stripe’ layout style. New highly in demand GDPR module is included in Argento package. Read more about this module at our documentaion site. Fix duplicated H1 element in header of Luxury theme. Luxury theme supports FontAwesom icons. RTL support for Flat theme. Improved compatibility with Magento 1.7.x. Improved source code of included modules (use of unified image uploader from TM Core in admin interfaces). Fixed error when page identifier is entered in invalid registry. Integration with ManaDev Layered Navigation. New awesome Nowrap feature. It always keep top level menu items in single row. And it is responsive. Metadata Templates: improved attribute directive output for numeric attributes (truncate trailing zeros in decimal part). Fix ‘product ID already exists’ error on checkout success page. Respect “Reindex… via Cron” config options. Cron process ignored config settings in previous versions. 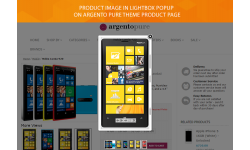 Full RTL support for Argento Argento and Argento Luxury themes. New ‘404’ page at Luxury theme so your customers don’t be upset but interested in staying at your store. New expanded layout for product tabs. 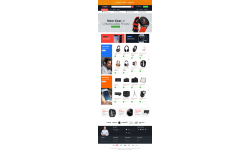 Fix issue with ‘More Products’ button on product listing (content not loading, incorrect image sizes, black image background). Fix not woking “Estimate shipping” and “Apply coupon” forms at checkout cart page on Magneto version less than 1.9.2.0. Overall stability and source code improvements. Improve compatibility with Magento Enterprise Edition. Improve responsive styles for widget layouts with 3 and 5 columns. New tabs layout - expanded tabs. You can change tabs layout in extension system config or in widget options. New option “Sticky tabs header” - tabs header sticks to top of the screen while tabs conteiner is in user viewport. You can enable sticky option in extension system config or in widget options. Compatibility with new Highlight carousel template. 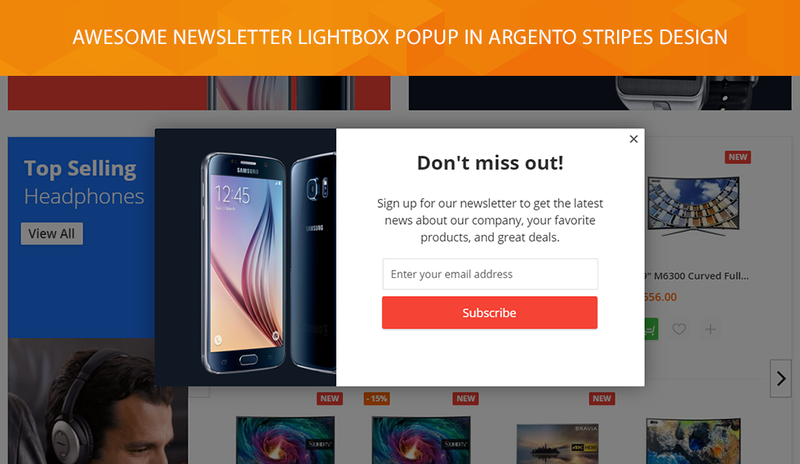 Improve behavior on stores with Argento themes and RTL contant direction. 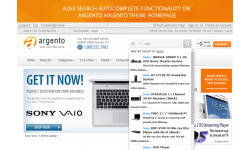 SEO Templates - improve ‘products’ directive for category templates. Works with attributes that are not filterable also. Cron option works only on global level of config. So it is removed on other config levels. Fix missing message after posting new testimonial. 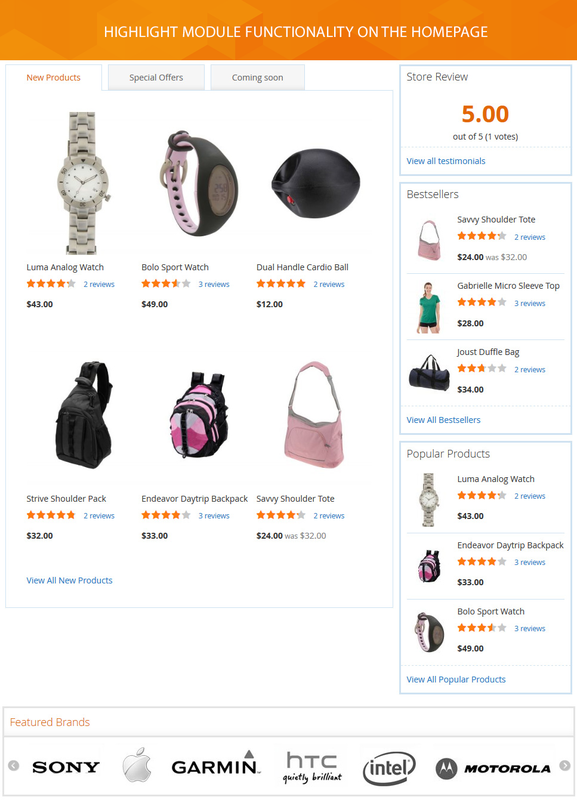 Fixed duplicated product structured data on product page. No empty nodes in JSON-LD structured data. Fix URL parsing when URL rewrite ends with ‘/’. Disable SEO URLs when direct controller URL used instead of URL rewrite. Improved integration with Swissup ALN module (stock filter, rating filter, new filter). Improved query string parsing when multiple values applied to filter. If filter separator enabled add it to URLs only when there are applied filters. 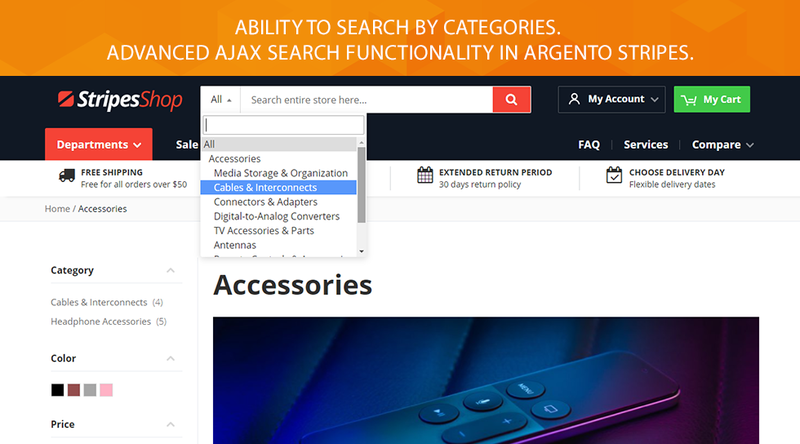 Added new breathtaking config sections for every Argento theme - ‘Category page and other listing pages’ and ‘Product page’. 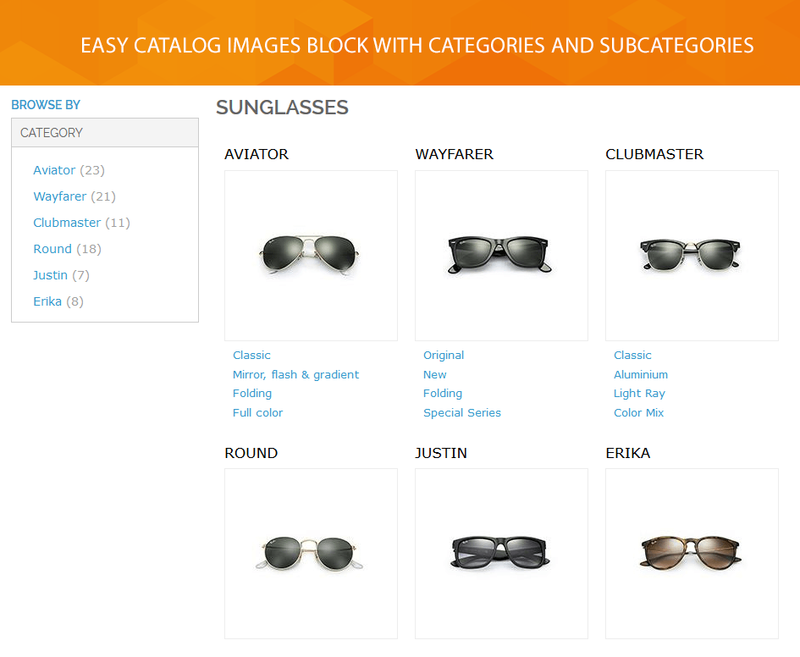 There you can setup product image resize options for listing pages, widgets and product pages. Check how this config looks at Luxury image size settings for category. Reduced number of templates. Check upgrade instruction to find out what templates you can get rid of. Added ability to disable layered navigation output via configuration. Magento’s Cookie Restriction Mode support added. Fixed possible “Content mismatch” error when using third-party layered navigation modules. Fixed ‘reached 100 match iterations’ when URL end with /. Fixed customer email template in nl_NL locale. Scroll to “Review form” itself instead of top of Review section when visitor clicks “Add review” link on product page. Added options to setup size of og:image that facebook uses in shared URLs. Added new position for label - ‘hidden’. 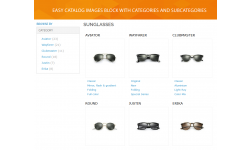 With help of this position you can hide label on product page or category page. XML Sitemap - prevent memory leak during sitemap generation. Added new option to reindex orders with specific statuses only. Fixed crush of cron reindex on huge number of orders (10K+). Css editor improved in theme editor backend. CSS syntax highlight added.